How do you measure greatness? Awards and money, perhaps, along with the love of the people. Pixar Animation Studios has all three. The studio has earned twenty-six Academy Awards, five Golden Globes and three Grammys. In addition to decades-long box office ownership, Pixar has also excelled in the most difficult of departments: finding the heart of its viewership and moving them to tears. Walt Disney Animation Studios has failed in none of these areas. They are equally familiar with public adoration, box office juggernauts and more. Zootopia, their most recent animated venture, continues to command audiences around the world, sitting at a nearly perfect 98% on Rotten Tomatoes. Yet, without exception, there exists an unquantifiable difference between the films that Pixar and Disney create. As with the best home-cooking, Pixar has secret recipes that distance themselves from the competition, helping create true cinematic experiences that defy the boundaries often set by the world of "animation." And by the way, we do know that Pixar is owned by Disney, but it still acts as its own production house, and there is still a noticeable difference in quality between the movies. So with Finding Dory, the latest Pixar joint, on the horizon, let's take a look at 12 Ways Pixar Beats Disney At Their Own Game. Pixar knows no limitations. Rather than asking how things "are," the creatives at Pixar bend reality and investigate how they "might be." In contrast to many Disney films where exotic location drives the plot, Pixar stories start from the heart. While Disney has certainly ventured outside of the fairy tale genre in recent years, that approach remains the company's most reliable formula (see Frozen and The Princess and the Frog). The masterminds behind Toy Story, Up and Inside Out have a less discernible method, only places to go and interpersonal questions to explore. Indeed, Pixar's creative heads like John Lasseter and Pete Docter, have attributed their anthropomorphic toys, flying houses and talking emotions to curiosities arising in their own lives. At Pixar, amid oceans, space and the great outdoors, the biggest journeys always happen on the inside. Pixar movies are masterclasses in parenting. Inside Out tells the story of a young girl named Riley, uprooted from her comfortable, middle-America home and forced to adapt in San Francisco. Told from the perspective of personified emotional receptors like Sadness, Joy and Fear, Inside Out is a feature-length study in matters of the heart. While Riley's plight carries the story, director Pete Docter embeds several key moments engineered specifically for adults. Embodying the occasionally stark differences between male and female modes of thinking, Riley's parents attempt silent communication across the dinner table. The mom signals something completely misunderstood by the dad, sending him into overdrive: "Uh-oh, she's looking at us...what did she say? Is it garbage night? Uh, we left the toilet seat up! What is it, woman? What!" These quick moments pepper the Pixar universe and give adults the attention they deserve in the animated world. Over the last twenty years, Pixar's movies have made us find likeness in fish, robots, septuagenarian men, pull-string toys, dinosaurs and more. Their creative team understands that the human experience is transmutable, and perhaps best understood in the physical form of animals and playthings. A modern Aesop, Pixar tells tales with foundational messages and morals more satisfying than any chase scene or 3-D action adventure. Andrew Stanton, director of Finding Nemo, made it abundantly clear that Marlin, the worrywart father fish (voiced by Albert Brooks), was based on himself. To raise a child from infancy to adulthood often feels like you're a clownfish in the blue abyss, and Finding Nemo puts that concern front and center. In Zootopia, Disney's clever concept for an alternate animal-based universe, similar emotions are expressed. Despite the jokes and the fast-paced story, the lack of sincerity from the worrying parents leaves Zootopia 20,000 leagues behind Nemo. The human experience promises that just as we have entered the world, we will also leave it. The Pixar creatives embrace this reality in each of their films, anchoring them in an awareness of time and uncertainty. Somehow, they manage to weave the universal theme of loss into their stories without ever becoming morbid. In The Lion King, Disney famously killed Mufasa in a violent way, at the hand of the unflinchingly evil Scar. An animal-kingdom Hamlet it may be, The Lion King pits good versus evil in the most rudimentary of ways. Contrast that with The Good Dinosaur, Pixar's latest film, where Arlo, the title character, witnesses the death of his father by raging floods. As with Mufasa, "Poppa" dinosaur puts his son's life ahead of his own, but Pixar knows how fragile life can be. It doesn't need a malevolent Scar-like character to end relationships. The forces of fortune and fate are meddlesome enough. Similarly, the montage in Up show's Carl's happy days with his young bride, only for him to outlive her and her fatal illness. It is a crushing sequence that leaves no dry eyes, yet it is also beautiful in its sensitive depiction of death. While Disney animated movies may spin a good yarn, few of them are known for their sense of humor. Pixar equals its emotional understanding with rare comedic timing. It all starts with rich characters like Dory, who can't remember the last the thing she said, or Mr. Potato Head, an irascible, New Yorker spud. Then there's Dug, the dumbest dog in all of cinema, who uses a voice modulator to speak his mind (which is usually, "Squirrel! "), or Buzz Lightyear, the Rambo-wannabe toy with a Napoleon complex. There is no equal to this kind of character development in any animated studio. No wonder, then, that a handful of Pixar movies have actually been nominated for Best Picture at the Academy Awards, showing the transcendent quality of the studio's best characters. If you're not dabbing your eyes at a Pixar movie from sadness, then you're probably doing so out of laughter. Many directors and writers watch movies with the sound on mute. If done correctly, the film and its myriad components should be able to convey the message and the moment with each individual frame. No wonder, then, that Pixar excels in the art of the comfortable (and occasionally uncomfortable) silence. Up and The Good Dinosaur are two hallmark examples of movies that tell multi-layered and impactful stories with little to no dialogue. The pre-historic adventure is truly like a silent film, with little Arlo playing the part of Charlie Chaplin (though not intentionally to comedic effect). Our loud culture depends on clanging cymbals and bombast to keep our attention, and perhaps that's why The Good Dinosaur went extinct at the box office. In Zootopia and Frozen alike, Disney hired Shakira and Idina Menzel to turn their animated ventures into music videos. 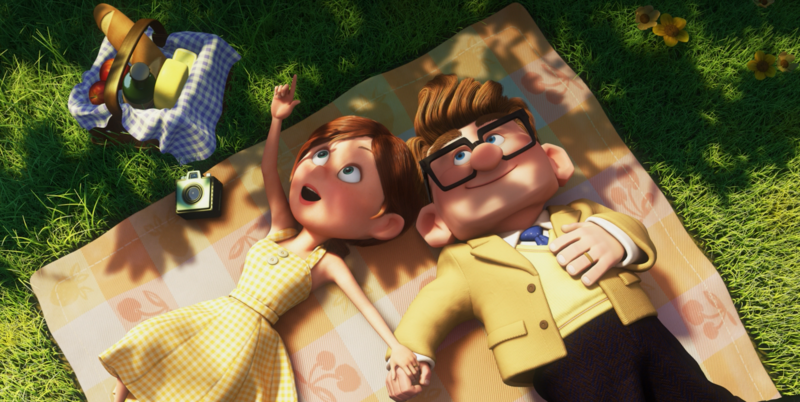 Both movies entertained millions around the world, but from an artistic standpoint, only Pixar would dare show the entire marriage of Carl and his wife without a single word of dialogue. Characters are often separated by "black and white" or "good versus evil," providing heavy distinctions with very little gray area. Pixar has its fair share of villains, but they rarely impact the story. In Toy Story 2, Emperor Zurg poses a menacing yet altogether brief threat to Woody, Buzz and Co. The larger presence of abandonment, loneliness and the search for personal value permeate the protagonists. In many of Pixar's films, from Ratatouille to The Incredibles, villainy is depicted as an interior obstacle for the characters. The heroes are both their truest advocate and and their own worst enemy. Throughout the story, these negatives qualities are at once exacerbated and expunged by encountering other characters along the way. While Disney has undoubtedly created some frightening villains, their films often lack the complexity that defines Pixar's characters. "Simplicity is the ultimate sophistication." No wonder, then, that Steve Jobs (the father of that quote) played a role in the success and development of Pixar. Over the last twenty years, the movies owe much of their success to truly succinct and inspiring screenplays. Molded around protagonists with seemingly unfulfillable dreams, Pixar creatives reinforce the underdog's tale by making the impossible more approachable. Each film is an air-tight story with very little fluff, preferring substance and messaging over cute asides. Pixar scripts are lean machines, with almost every beat and moment servicing the larger narrative and growth of the protagonist. At the same time, Pixar stories know how to hurt. In The Good Dinosaur, Arlo gets severely banged up trying to earn his marks as a capable Apatosaurus. Ratatouille's Remy struggles with critical ire and seemingly insurmountable odds. Woody can't keep up with Andy's increasingly adult attention span. Each of these stories begin with a tightly packed premise and end after an unfurling adventure that exposes the characters' vulnerabilities while exalting their potential. Animation enables creatives to defy mental gravity. With a good story and their pen, they can do whatever they please. Pixar has done just that, building an artistic oeuvre of stories spanning the galaxy. Disney, though an elite animation studio, relies less on distinguished human characters and more on pomp and circumstance to sell their story. From a restauranteur-dreaming rat to a family of superheroes, a meteor-surviving clan of dinosaurs to a fleet of talkative cars, Pixar has built universes that require mere seconds to earn the audience's trust. Nothing seems foreign in even the most extreme locations. Why? Because Pixar understands that their movies succeed not solely because of the enhanced digital environment, but because of the characters that occupy it. That has given Stanton, Lasseter and Docter free reign in exploring the makeup of the human mind. A feast for the eyes, Pixar's films offer a complete assault on the senses, with world-class soundtracks often reserved for only the very best films. Thomas Newman remains one of the most Oscar-nominated composers still seeking a win. Much of his commercial success has been found at Pixar, having scored both Finding Nemo and Wall-E. His iconic sound complements Pixar's state of the art visuals, particularly in Nemo, where his impressionistic sound captures the murky underwater theatrics onscreen. He's not the only Newman to have vaulted Pixar beyond ordinary animated films, however, joining Randy Newman's success with Toy Story and Monster's Inc, along with Cars and Monster's University. Michael Giacchino has also given his talents to Ratatouille, Cars and Up, the latter of which has some of Pixar's most moving melodies. Part of what made Star Wars: A New Hope succeed was its unabashed approach to world-building. Director George Lucas set up establishing shots to help viewers get situated in the galaxy far, far away. As a result, our minds would wander at every nook and cranny introduced, wondering what existed in the smallest and most fleeting on-screen details. Pixar understands the art of building complex landscapes and universes for their characters to enjoy. Monster's Inc. thrived in creating worlds within worlds, with zip-lining doors leading to unsuspecting children's closets. Finding Nemo made the ocean at once robust and also intimate. Toy Story made a childhood bedroom seem expansive. WALL-E made space feel like home. In all of their ventures, the Pixar creative team knows how to make the audience feel welcome in their characters' natural environments, no matter how outlandish they seem. Things now taken for granted, like moving hair or flowing water, were once a huge challenge for the company to create. Technology does not permit wanton storytelling, however, and Pixar has been careful to integrate new advancements only when they aid the larger narrative. This is a defining quality of Pixar's success. There you have it! Where do you stand on Disney and Pixar? Let us know in the comments below!